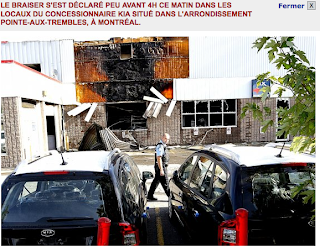 Did a Québec Blogger Cause a Car Dealership to Burn? Early this morning, a KIA dealership burned down in Montreal. The fire department suspects that the fire was a result of criminal activity because some cars in the lot were found with their tires slashed. Normally, this wouldn't be big news. Things burn down regularly in irregular ways in Montreal, and for the most part no one pays much attention. It's usually a matter of someone not paying their protection money to one of the many organized crime syndicates that ply their trade around here. This time, though, it may be different. Early this week, the dealership was targeted by a Québec blogger, Gab Roy, who claimed that it had ripped off his friend Genevieve, an attractive former reality TV contestant. Apparently, Genevieve had placed a $500 deposit on a car at KIA Pointe-aux-Trembles, but she eventually bought another car at a different dealership. When Genevieve returned to get her deposit back, KIA Pointe-aux-Trembles refused to return it. Founded in 1935, the John Dewey Society exists to keep alive John Dewey's commitment to the use of critical and reflective intelligence in the search for solutions to crucial problems in education and culture. We subscribe to no doctrine dogmatically, but in the spirit of Dewey, we welcome controversy, respect dissent, and encourage responsible discussions of issues of special concern to educators. We also promote open-minded, critical reconsiderations of Dewey's influential ideas about democracy, education, and philosophy. At this upcoming conference, we welcome contributions that either relate specifically and directly to Dewey's life and work OR that represent the "spirit" of John Dewey. They may be in the form of papers, panels, or other formats described by the author. Please submit an abstract of no more than 750 words. You do not need to be a member of the John Dewey Society to submit a proposal, although you will be asked to join should your paper be accepted. The deadline for proposals is September 5, 2011. They should be sent to Kyle Greenwalt, Secretary of the John Dewey Society, at greenwlt@msu.edu. As a graduate student at the Stanford School of Education, I often attended lectures in a large lecture hall at CERAS, the Center for Educational Research. The distinguishing feature of the otherwise ordinary lecture hall was that it was equipped with large cash register-like keypads that were embedded in the tables in front of each seat. When we asked what the keypads were for, we were informed that they were part of a “state-of-the-art” student feedback system that had been installed during the 1960s. During the course of a lecture, students would press Y or N on the keypad to indicate whether they understood a lecturer’s point, or they might key in a specific number to respond to a mathematical question. When they were installed in the late 1960s, these keypads were hailed as a revolutionary educational technology. No longer would lecturers have to wonder whether students understood a particular point; instead, students could anonymously key in Y or N. A breakthrough in student learning was surely just around the corner. As it happened, even in their 1960s and 70s heyday, the keypads were seldom used. The machines turned out to be unreliable, and, more importantly, the professors at the School of Education turned out to be largely uninterested in the supposed transformative power of the keypads. By the time I arrived at Stanford in 2001, the technology had been dead for twenty years. I was still free to press Y or N to indicate my low level of comprehension or my secret disagreement with the lecturer, but, alas, no one was monitoring the response. Imagine my surprise, then, upon discovering that Stanford’s white elephant is making a 21st century comeback. This time, however, the keypads have gone wireless. In the contemporary version of the “student response system,” students are issued small credit-card sized “clickers” upon which they can press Y or N or a numerical response. As was the case with the Stanford system, the results are made available to the lecturer, and with our 21st century technology, the fruits of this “instant polling” can now be instantly displayed in a nifty Powerpoint slide. Only a few short months ago in Wisconsin, protesters engaged in what the Christian Science Monitor called, a “week of rage” through protests over the governor’s budgetary cuts that would weaken collective bargaining power of public employees. Their rage was compared to that expressed by tea party activists over the past two years and even activists leading the protest that caused Egyptian President Hosni Mubarak to resign. Over the weekend, thousands of teachers simultaneously braved temperatures over 100 degrees and a chilling political climate that has worked to silence many educators to speak out at the Save Our Schools March and National Call to Action in Washington D.C. This grassroots, teacher-led organization (spearheaded by teachers Anthony Cody and Nancy Flanagan) brought together teachers from around the country in support of four principles: equitable funding for all public schools, an end to overreliance on high stakes tests for punitive ends, teacher and family leadership in forming education policies, and curriculum development within local communities. Hundreds gathered beforehand at a two-day conference at the end of the week, while thousands appeared Saturday for speeches and a march from the Ellipse to the White House. 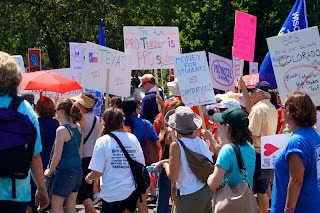 The march was kicked off by speeches by higher education leaders Jonathan Kozol, Deborah Meier, Diane Ravitch, Linda Darling-Hammond, and Pedro Noguera, as well as passionate talks and songs by teachers, preservice teachers, and administrators. Finally, some Hollywood sparkle lent support to the teachers’ movement via a heartfelt speech by Matt Damon and a brief comical piece by Jon Stewart. As Ravitch noted in her speech, this event was the first of its kind in a long history of teacher frustrations with educational policy, especially in the past decade. Here’s to hoping that it’s the first of a sustained and effective movement to truly champion educators’ voices in school reform.